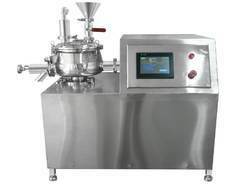 Pioneers in the industry, we offer high shear mixer, rapid mixer granulator, lab model rmg, wet granulator, dry granulator and pilot scale mixer granulator from India. 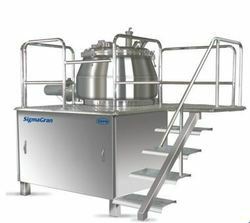 Rapid Mixer Granulator is used for wet mixing for granulation that has been an enhanced application in the Pharma industries. Wet granulation is a widely used process in the pharmaceutical industry as an important part of improving the flow properties, homogeneousness, and compressibility of the solid dosage powder mix. ü By adding of suitable binder wet massing is accomplished by high mechanical agitation by an impeller and chopper. ü Mixing, densification, and accumulation of wetted materials are achieved through shearing and compaction forces applied by the impeller. The impeller rotates on the horizontal shaft at a rotational speed corresponding to a radial blade tip speed and primary function of the chopper is to breaks lumps into smaller fragments to achieve a more homogeneous. Our company is a well-known name among reckoned manufacturers, suppliers and exporters of Lab RMG. These are made in line with the defined industry norms using high quality metals and components. Furthermore, our products are available in various technical specifications so as to meet varying demands of the patrons. Clients can avail these products at competitive prices from us. 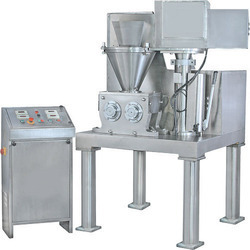 Rapid Mixer Granulator is used for wet mixing for granulation that has been enhanced application in the Pharma and food industries. 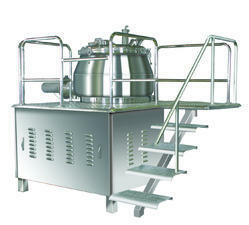 RMG 400 Liters is with Platform and Staircase made of SS-304. Simply it is structure based design and discharge height will be design based on FBD container height. Our firm holds a prominent market position in manufacturing, supplying and exporting a superior grade gamut of Dry Granulation system having twin feed screw design. The raw material used in fabricating the systems is sourced from the well-known vendors of the market. We have been manufacturing hydraulically operated floated roller systems thus ensuring to have ensured desired flake size and minimum maintenance. Moreover, the automated material charging mechanism is also provided through sigma trans pneumatic conveying system. 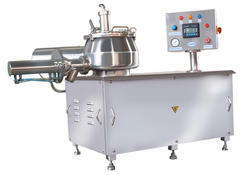 ü Rapid Mixer Granulator is used for wet mixing for granulation that has been enhanced application in the Pharma industries. ü Wet granulation is a widely used process in the pharmaceutical industry as an important part in improving the flow properties, homogeneousness and compressibility of the solid dosage powder mix. ü The impeller rotates on the horizontal shaft at a rotational speed corresponding to a radial blade tip speed and primary function of chopper is to breaks lumps into smaller fragments to achieve a more homogeneous. üWet granulation is a widely used process in the pharmaceutical industry as an important part in improving the flow properties, homogeneousness and compressibility of the solid dosage powder mix. 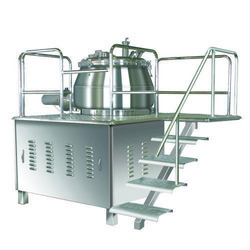 Rapid Mixer Granulator is used for wet mixing for granulation that has been the enhanced application in the Pharma industries.